When you are facing an imminent move, one of the most important questions is how to move huge, bulky items. Moving a pool table to your new place requires a lot of effort, other people’s help and proper equipment. Due to its dimensions, hiring professional movers would be the smartest idea. Here are a few things that you need to know if you are moving a pool table. – Find out what it takes to move a pool table successfully. Its dimensions, weight, shape and moving distance will define the level of complexity of the overall process. – Decide whether the pool table should be moved at all. Is it worth the money and effort? If you are moving to another country, selling your current pool table and purchasing the new one would be probably the most appropriate thing to do. 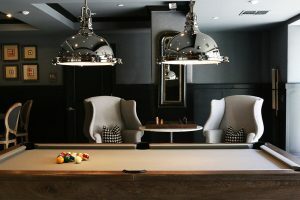 – Although you have a lot of friends who are willing to help you with the move, you need to know that moving a pool table is a tricky, potentially dangerous and expensive affair. – Moving a pool table is not about heavy lifting only. It needs to be disassembled, packed, secured, safely handled and transported, properly reassembled and set up at your new place. A company that specializes in moving pool tables will be able to provide the most reliable help in this case. They know how to carry it and where to lift in order to reduce the effort. – Determine your moving budget so that you can decide whether you can afford to hire professional pool table movers. Know exactly how much money you will have to set aside for dismantling, packing, transporting and reassembling your pool table by professional movers. – If you are moving locally, within the same city or even neighborhood you may want to know how to move a pool table by yourself. – Gather helpers and volunteers that are willing to do heavy lifting. Even the dismantling process is a bit complicated since there are many heavy components to deal with. – Mind lifting technique. Remember that you need to lift with your legs, not with your back in order to avoid some serious injuries. – If you have kept the manual that came with your pool table follow the instructions for disassembling and reassembling. – First remove the six side pockets (4 corner pockets and 2 side pockets). – Wear protective goggles while taking out the staples. – Remove and store safely the bolts under the rails and then remove the felt. Afterwards you will see if the slate is composed of only one huge component or a couple of individual pieces. – Disassembling the slates is probably the most demanding task. Take out slates one by one using appropriate equipment and tools. Put small components like screws in plastic sealing bag and attach it to some bigger piece. Slates can get easily damaged if not handled carefully so decide whether it is worth taking that risk. – Take photos of the disassembling process if not sure how to put it back together afterwards once you reach the new place. – Removing the legs and the frame off the pool table will be a piece of cake compared with the previous task. Wrap every piece of the pool table separately so as to prevent them from getting scratched or damaged. – Take measurements of your new place so that you can be sure that your pool table fits. – Reassemble your pool table using the original manual and make sure all components are undamaged. Should you move to a house with a swimming pool?